The Other properties of a control are properties that did not fit neatly into any other category. This does not mean that they are unimportant. In fact, you can find some of the most important and useful control properties under the Other properties of a control. To access these properties, select the control, invoke the Properties window, and then click the Other tab of the Properties window (see Figure 6). Let’s take a look. Figure 6. The Other properties of a control. Name— The Name property allows you to name a control. You use the name that is set in this property when you refer to the control in code, and this name is also displayed in various drop-down lists that show all the controls on a form. It’s important to name controls because named controls improve the readability of code and make working with Access forms and other objects easier. Status Bar Text— The Status Bar Text property specifies the text that appears in the status bar when a control gets focus. The setting of this property overrides the Description property that you can set in a table’s design. Enter Key Behavior— The Enter Key Behavior property determines whether the Enter key causes the cursor to move to the next control or to add a new line in the current control. 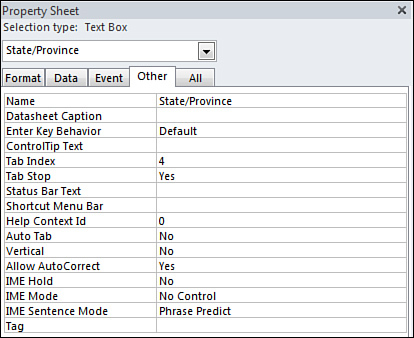 You will often change the setting of this property for text boxes that you use to display the contents of memo fields. Allow AutoCorrect— The Allow AutoCorrect property specifies whether the AutoCorrect feature is available in a control. The AutoCorrect feature automatically corrects common spelling errors and typos. Vertical— The Vertical property is used to control whether the text in a control is displayed horizontally or vertically. The default setting is No, or horizontal. When you select Yes (vertical display), Access rotates the text in the control 90 degrees (see Figure 7). Figure 7. The Address text box with the Vertical property set to Yes. Auto Tab— When the Auto Tab property is set to Yes, the cursor automatically advances to the next control when the user enters the last character of an input mask. Some users like this option, and others find it annoying, especially if they must tab out of some fields but not others. Default— The Default property applies to a command button or to an ActiveX control and specifies whether the control is the default button on a form. Cancel— The Cancel property applies to a command button or to an ActiveX control. It indicates that you want the control’s code to execute when the user presses the Esc key while the form is active. Status Bar Text— The Status Bar Text property specifies the message that appears in the status bar when a control has the focus. Tab Stop— The Tab Stop property determines whether the user can use the Tab key to enter a control. It’s appropriate to set this property to No for controls whose values rarely get modified. The user can opt to click in the control when necessary. Tab Index— The Tab Index property sets the tab order for a control. I generally set the Tab Index property by using the Tab Order button found in the Tools group on the Design tab of the Ribbon rather than by setting the value directly in the control’s Tab Index property. This allows me to set the tab order graphically, which is more intuitive, easier, and saves me a lot of time. ControlTip Text— The ControlTip Text property specifies the ToolTip associated with a control. The ToolTip automatically appears when the user places the mouse pointer over the control and leaves it there for a moment. Tag— The Tag property is used to store information about a control. Your imagination determines how you use this property. The Tag property can be read and modified at runtime.